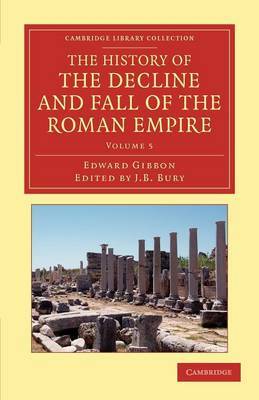 The pre-eminent historian of his day, Edward Gibbon (1737-94) produced his magnum opus in six volumes between 1776 and 1788. Reissued here is the authoritative seven-volume edition prepared by J. B. Bury (1861-1927) between 1896 and 1900. Immediately and widely acclaimed, Gibbon's work remains justly famous for its magisterial account of Roman imperialism and Christianity from the first century CE through to the fall of Constantinople and beyond. Innovative in its use of primary sources and notable for its tone of religious scepticism, this epic narrative stands as a masterpiece of English literature and historical scholarship. Volume 5 covers the period 565-1356 CE, addressing the Lombard conquest of Italy and the Persian siege of Constantinople, the divisive Christian doctrine of the incarnation, Byzantine rulers up to 1185, the reign of Charlemagne in the West, the life of Mohammed and the spread of Islam.